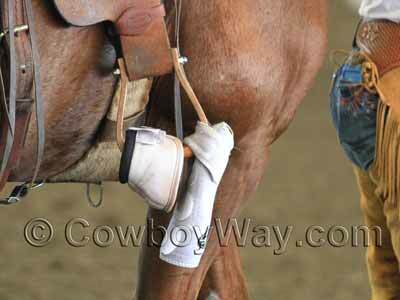 Protective splint boots for horses. 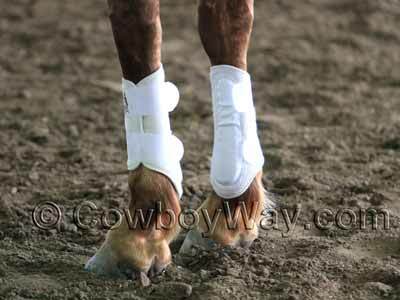 Splint boots got their name because they protect the small bones on a horse's legs called "splint bones." Splint boots are designed to help prevent a horse from injuring itself if it should interfere (strike one leg against another). They are commonly used during hard or active riding, or during turnout time. Below are splint boots for sale on eBay and Amazon. Please scroll down underneath the boots for sale for more information about splint bones, the purpose of splint boots, and for good things to know before buying a pair of splint boots. 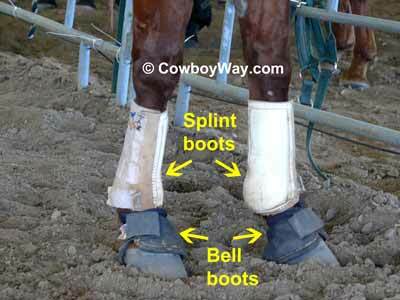 Below: Splint boots on the front legs of a horse. What are the splint boots made of? Many are made from neoprene, which is a soft, flexible, synthetic rubber that is also lightweight, washable, and durable enough to withstand the considerable rigors of being used a protective horse boot. Splint boots are also made of leather. While leather splint boots often cost more than their neoprene counterparts good quality leather splint boots provide excellent protection and are extremely durable when properly cared for. What size are they? Splint boots often come in sizes such as small, medium, and large. Make sure you know what size your horse needs and the sizes available from the seller. If in doubt, be sure to ask the seller about their size recommendations for the brand and style you're interested in. Do the splint boots close with hook-and-loop closures? If so, you may want a little more information. For example, with some styles of splint boots the tabs of the hook-and-loop closures are wrapped around the horse's leg and can then be pressed anywhere onto the boot to provide a secure closure. With other styles, though, after the tabs are wrapped around the legs they must be pressed onto special, sewn-on, patches on the boot in order to close. While the first type provides a more more flexible and customizable fit, the second style is considered by some to be more durable. How many boots do you get? If splints boots are just that - splint boots - they are typically sold by the pair (remember, since it is more common for a horse to interfere on the front legs than the back legs, splint boots are usually put on the front legs only). However, if the splint boots are part of a more comprehensive boot such as a sport boot or combination boot, they might be sold in pairs or sets of four. 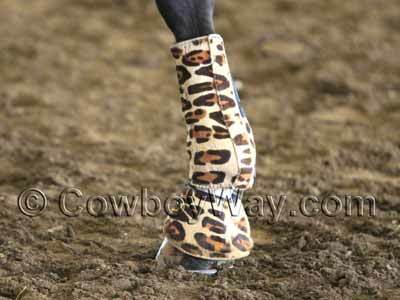 Below: Cheetah print splint boots being used with matching bell boots. Below: Bell boots and splint boots attached to a stirrup. You see this a lot at horse shows, rodeos, and other horse-related events. It's an easy way to keep them handy. Splint boots are protective boots designed to help prevent a horse from injuring itself if it should interfere (accidentally strikes itself with one of its own legs) during hard or active riding. Some owners will also put splint boots on a horse during turnout-time if they feel the horse is likely to buck or play. Splint boots are placed on the cannon bone to protect another, smaller bone called the splint bone. Splint bones are found on the inside and outside of a horse's cannon bone on all four legs. Compared to the cannon bone the splint bone is smaller and thinner. It is bigger at the top and tapers down to be thinner at the bottom (see the images below). Splint boots are designed to protect the splint bone on the inside of the horse's cannon since there is little chance of interfering on the outside. Since it is more common for a horse to interfere on the front legs than the back legs, splint boots are usually put on the front legs only. 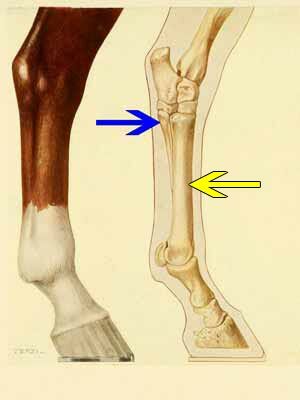 Below: The blue arrow is pointing to a splint bone while the yellow arrow is pointing to the cannon bone. There are two splint bones attached to each cannon bone; only one splint bone is visible in the drawing. 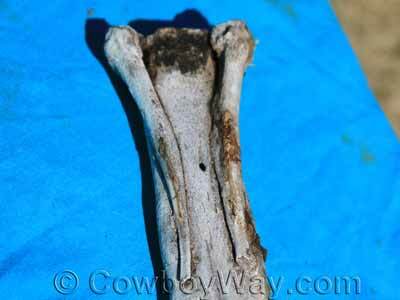 In the photo below the splint bones are clearly visible: They are the smaller bones on each side of the cannon bone. As you can see the splint bones taper down and get smaller towards the bottom. They actually taper down more than what is shown in this photo because in this case the very bottom of each splint bone was broken off, or chewed off by scavengers, port-mortem. 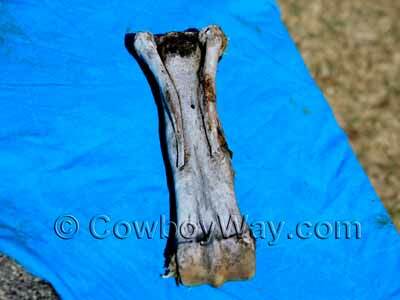 Below: The cannon bone of a horse with splint bones on either side. Below: The same image as above, this time with the splint bones highlighted in yellow. Below: A close-up look at the splint bones. Splint bones are thought by many researchers and scientists to be remnants of toes from prehistoric horses and have no function in horses today. If a splint bone should break or "pop" (become slightly separated from the cannon bone) most horses experience pain, but once the splint bone has "set" or healed it is typically pain free. A popped splint that has healed may leave a slight, visible bulge but this is usually only a blemish and is seldom a health or soundness concern. Below: Splint boots being used with bell boots.